Jasia has challenged genealogy bloggers to share the family stories that make us laugh, the ones about the jokers. Any family members of mine who happen by here might wonder where on earth Dana should begin, given the large number of cards in my family. I decided that in keeping with the nature of this blog, I should tell the one about my great-great-grandfather Amos Blakey Cunningham and the horse. Grandpa Amos grew up in Georgia, and my grandfather (his grandson) tells me that Amos’s father was a preacher. Amos’s father (Johnson Franklin Cunningham) was staying behind after services to shake hands, and Amos ran on home. Amos used to brag that his horse would follow him anywhere or do anything he told it to. On this particular day, a friend bet Amos that his horse wouldn’t go up the stairs in his house. Well, Amos couldn’t pass that one up, so he led the horse inside and up the stairs in his house. The only trouble is he couldn’t get the horse to come back down the stairs. Amos decided that if he covered the horse’s eyes, the horse might be less afraid. I am not sure if he used actual horse blinders or something else, but once the horse’s eyes were covered, it was fine. The only trouble was that it make a god-awful racket coming down the stairs, and Amos’s parents had come home! Finally, he decided he had better figure out a way make those hooves quiet, so he tied pillows to the poor beast’s feet. I’m not sure how he got the horse down the stairs without breaking its legs. Another time Amos went to church with his mother, Mary Anne Penelope Anthony Cunningham. He didn’t take his hat off when he entered the church, so his mother told him to take off his hat. He refused. Apparently, she jerked it off his head, only to discover he had hidden a bunch of marbles inside. They scattered and rolled quite loudly all over the wooden floorboards in the church. My mother remembers Grandpa Amos sticking his cane out to trip her when she ran by his chair. My grandmother tells me he used to put his medication in the toilet. You can learn a little bit more about Grandpa Amos through my great-great grandmother Stella Ophelia Bowling Cunningham’s diary (pdf). 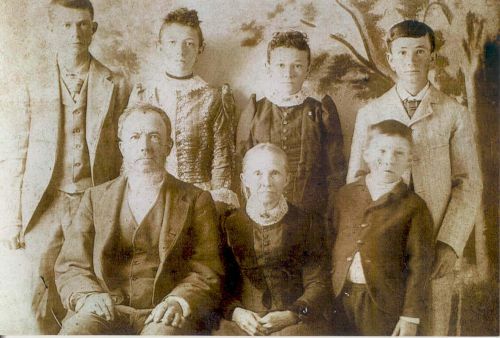 Amos is pictured below in the back row, far right. …and he looks SO innocent! Thanks for the smile, Dana!